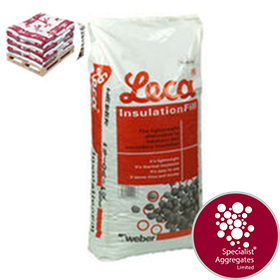 Insulation LECA - Super-lightweight expanded clay aggregate formulated with a non-toxic water-repellent coating, specifically designed to help prevent the absorption of moisture into the base layer under concrete slabs. One bag will cover approximately 1 Sqm at 50mm depth. But why open the bags ? The insulation material and the bag can be laid direct into a floor. To finish the sub-base open a small number of bags to fill edges and voids and bring the surface up to the desired level . A 21 pack pallet will cover approximately 7 sqm at 150mm depth. Note this will weigh just over 300kg kg compared to a similar volume of Type 1 coming in at nearly two tonnes ! This is a genuine and original premium quality LECA® product manufactured by Saint Gobain and distributed in the UK by Specialist Aggregates. This 10-20mm product has been formulated with a non-toxic water-repellent coating, specifically designed to help prevent the absorption of moisture into the base layer under concrete slabs. Leca®Insufill provides a quick and cost effective alternative to crushed Type 1 fill under extensions, conservatories, garages. patios and conservation projects. Additionally its convenient 50ltr packs weighing in at around 15kg are a boon when having to place bulk materials , "around the back" - "through the house" or "up steps". Expanded clay granules are made by pelletising and firing selected clays in a rotary kiln at a very high temperature. As it is fired, the organic compounds in the clay burn off forcing the pellets to expand and become honeycombed while the outside surface of each granule fuses to give a ceramic shell. The resulting granules are lightweight, porous, and have a high resistance to crushing. Being a natural product expanded clay aggregate contains no harmful substances, it is inert with neutral pH, The granules are resistant to frost and chemicals, and will not break down in water. 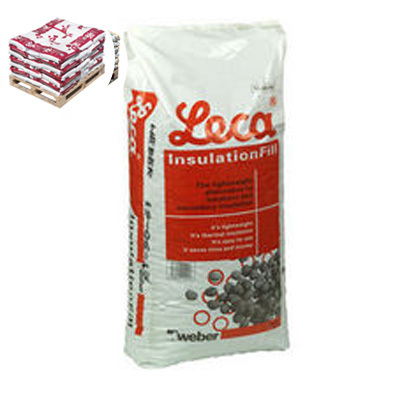 Leca® has a Class 1 fire certificate together with excellent sound and thermal insulation properties. Specify: 10-20mm Leca Insufill from Specialist Aggregates.